Dom Hans van der Laan (Leiden, 1904-1991) was a Dutch architect and Benedictine monk. After only a few years of architecture study Van der Laan developed a system of ratio principles based on the theory of the plastic number, which he invented. 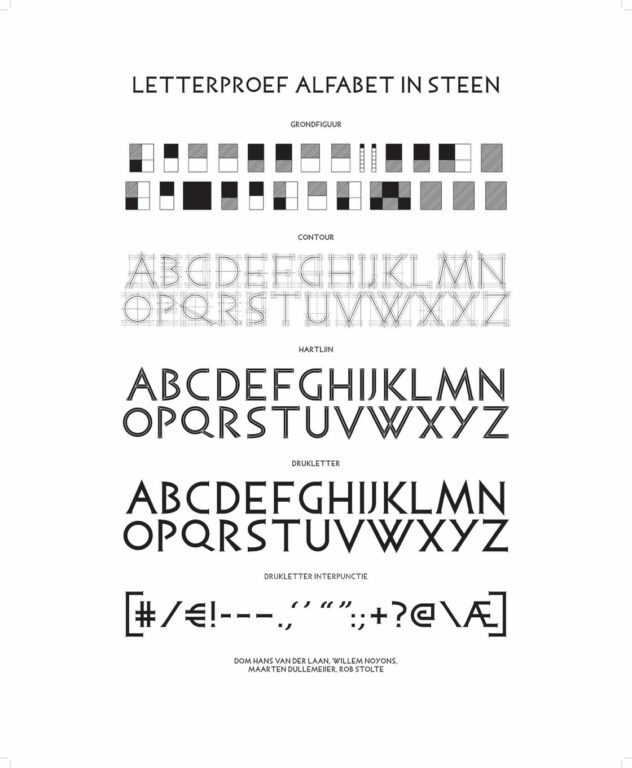 Using this theory Dom Hans van der Laan not only designed buildings, he also developed a typeface: the Alphabet in stone. This typeface is based on the Roman carved stone capitals that were used in the first century AD. 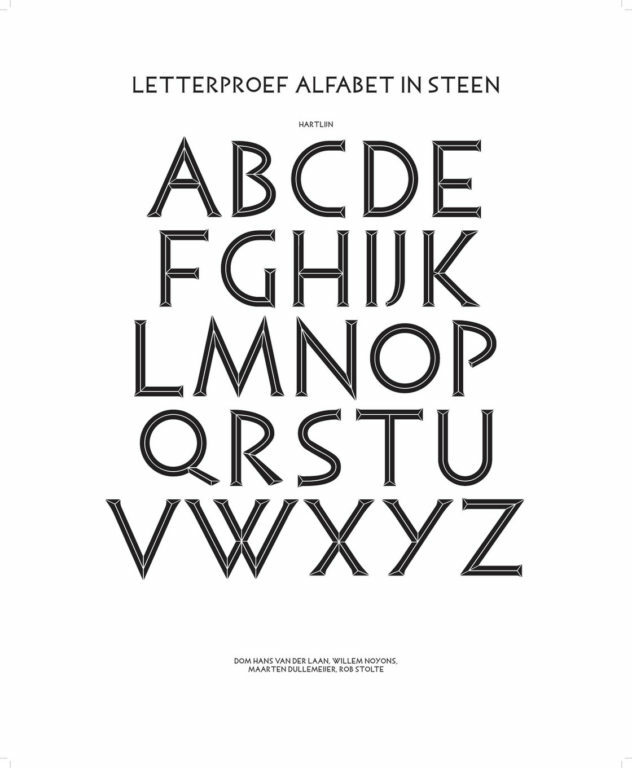 This exclusive typeface is now digitized and modernized. The complete font family contains four members: the basic figures from which the letters are created, a version with guides and contour lines, the regular font and the typeface showing the axes. 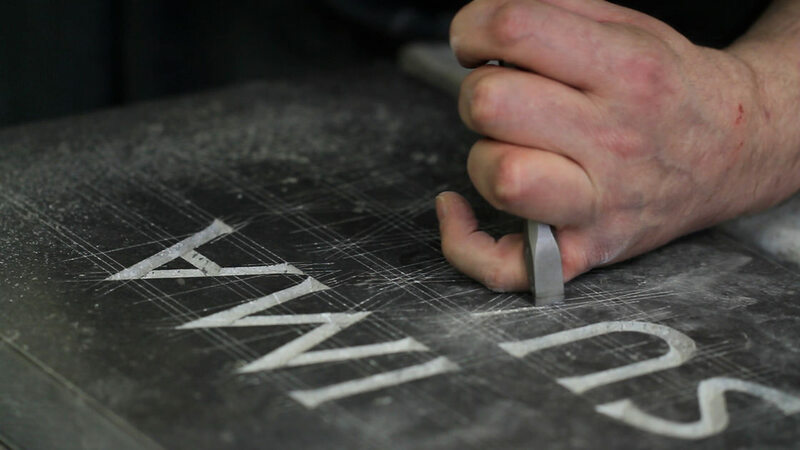 By digitizing this typeface, cutting letters in stone is simplified as it enables stonemasons to print directly onto a medium. 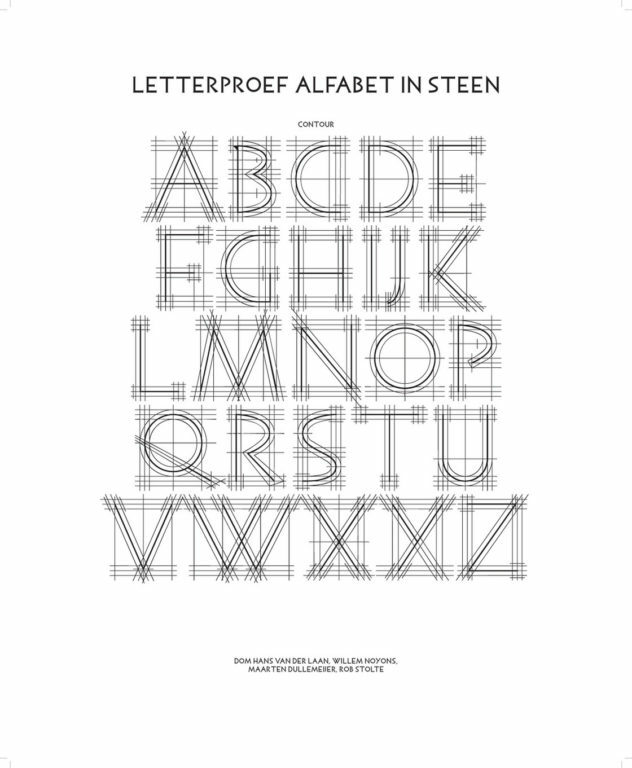 It saves a great deal of time because the letters do not need to be drawn by hand anymore. 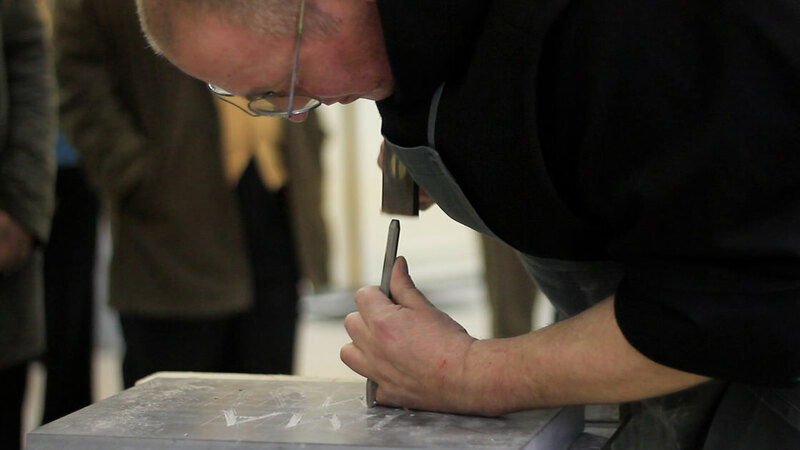 Modern techniques, like milling and laser cutting, are now possible too. 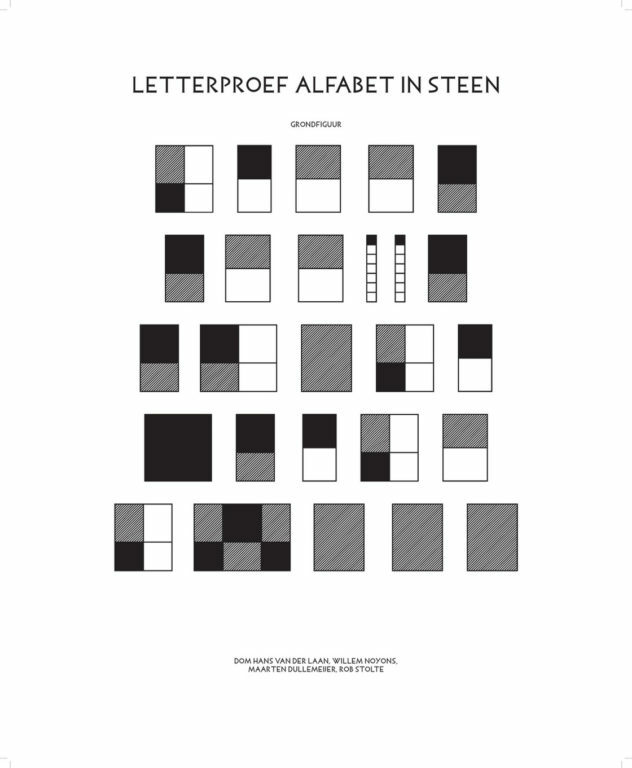 In his notes, Dom Hans van der Laan described the figures of the letters: ?The basic figures of the letters are the square and the rectangle 3:4. Standing alone or combined, they form a series of five authentic figures. Added together they form a series of five derived figures.? 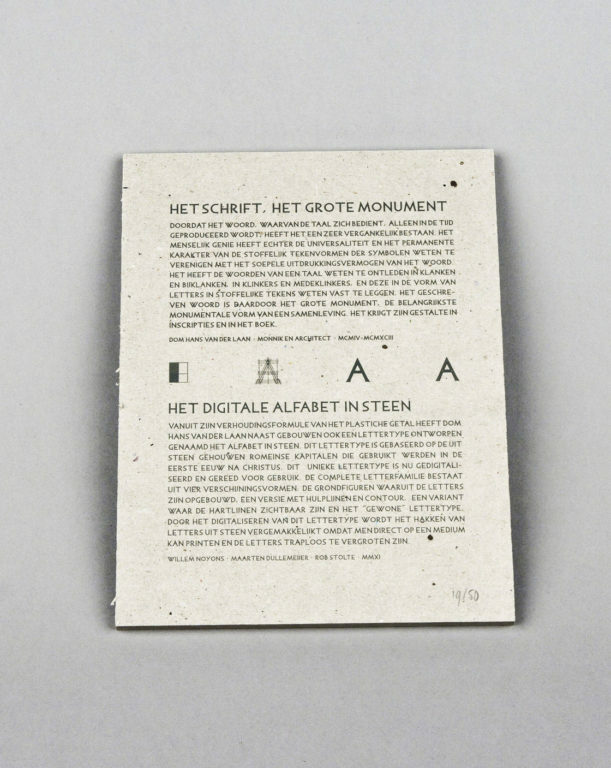 These authentic and derived figures are digitized for the first weight of the digital Alphabet in stone. Since a digital font cannot contain grayscale, diagonal shading is used for the rectangles ? in accordance with the drawings of Van der Laan. 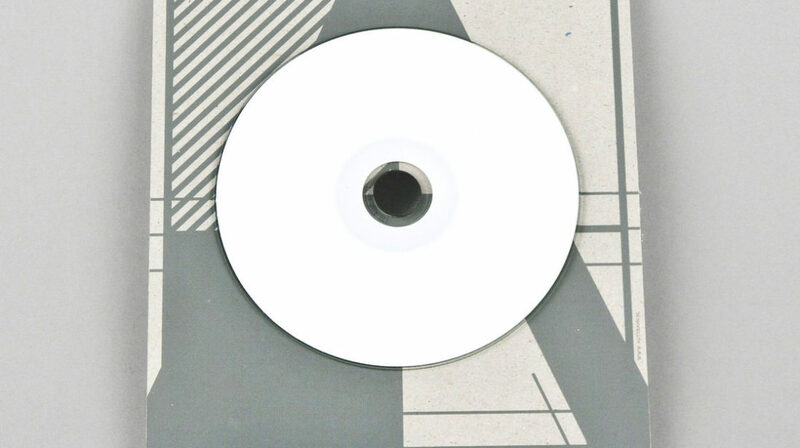 The line width of the figures is considerably thick, but this is essential for use on a small scale. Actually, the first weight forms the base for the other three weights. Van der Laan not only described the figures, he also defined the spaces between the letters. These spaces are also constructed from the authentic figures. The shapes of the adjacent letters determine which one of these figures needs to be used: ?The sides of the letters can be straight, angled or curved.? Defining spaces between glyphs is called kerning. In the case of the digital Alphabet in stone over 3,000 values were described. Despite the detailed notes of Van der Laan there are some gaps that Autobahn had to fill. For the letters I and J no authentic nor secondary figure existed. Autobahn designed a new character, based on their own interpretation. As for the spaces between the letters it was not always clear whether one side of a character was straight, angled or curved. The right side of the C or the left side of the J are examples of ambiguous cases. The shapes were visually determined when the letters were put together in a sentence. 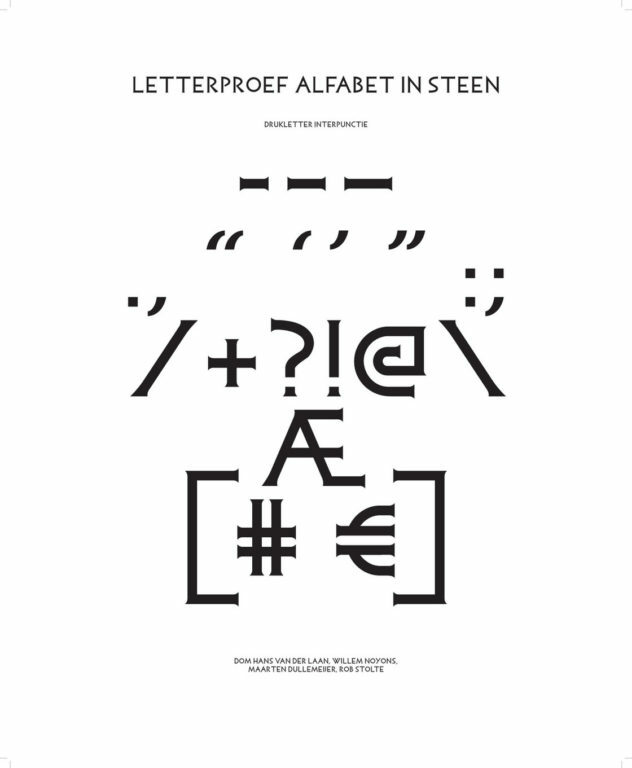 Van der Laan recognized the incompleteness of his notes when he called on the designer?s sense of form: ?Here are some measures of the letters: some are quite inaccurate. You have to use these measurements as a given and then draw the letters off the cuff.? 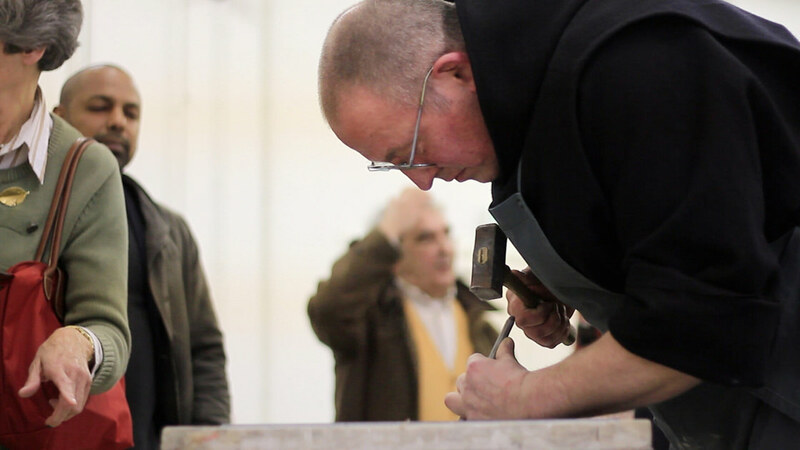 Although Van der Laan is talking to the stonemason, this remark also applies to the digitization process. The letters B, P and S, taking more time due to their curved shapes, are free interpretations by Autobahn.